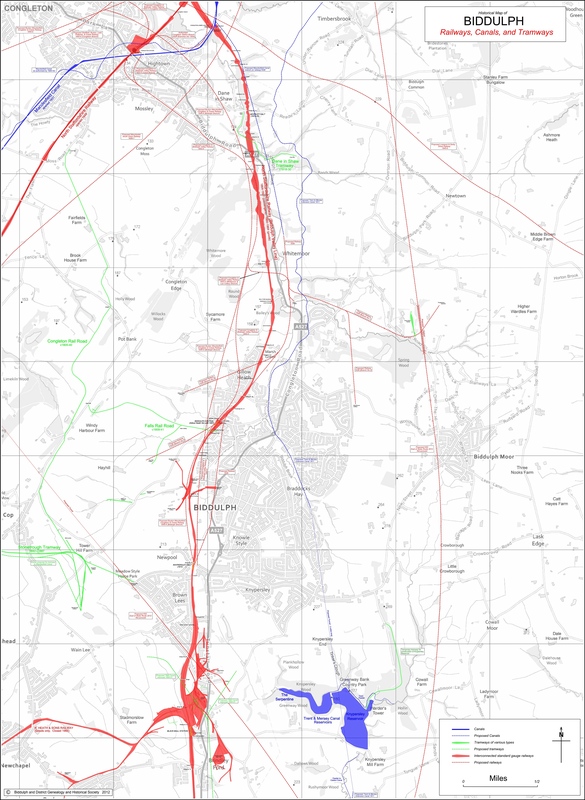 This map aims to show all the rail and water routes in the area, with those proposed schemes for which details have survived. The Trent & Mersey Canal Company surveyed a route through the Biddulph Valley in 1811, with a long tunnel at Knypersley, to counter other opposing canal schemes. It did not proceed and neither did a branch from the Macclesfield Canal to Whitemoor with connecting railways proposed in 1838. Although there were some earlier colliery tramways, Biddulph did not get a public main line until the North Staffordshire Railway opened their route in 1860.